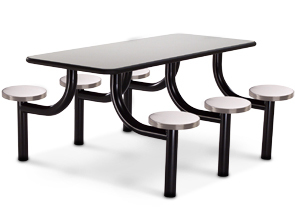 The table tops are available in a decorative high pressure laminate or stainless steel inlay. A game pattern top is optional with both styles (checkerboard / backgammon / solitaire with laminate top or checkerboard with stainless steel top. All frames and table top edges are black.